HoneyLimnos About us: D. Hasapis professional Beekeeper and wild Greek thyme honey production business. 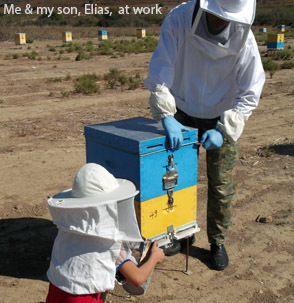 The sole proprietary Beekeeping family business of Dimitris Hasapis, HoneyHasapis™ was established at the beginning of 2011 in Moudros city, fulfilling an ambition of his life, the creation of a pure honey product free of chemical substances, under the best production methods; the monofloral Lemnian wild thyme 'Themari' (generic term in Greek) honey. From the start of its operation, HoneyHasapis, successfully completed all honey-related tests, including the strict production, control and consumer criteria of the end product, creating a different and unique of outstanding quality, wild thymus honey product, made in Greece. The business achieved its goals by reaching a wide audience, for its outstanding supreme quality monofloral Raw Greek wild thyme honey, followed by a polyfloral (aromatic/ flavored) Raw Greek wild thyme honey with wildflowers beehive product. 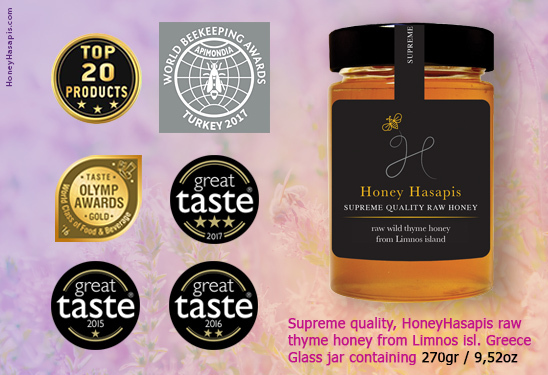 HoneyHasapis, supreme quality products, immediately reached the hall of fame by winning prestigious international awards & possitioned in the Top 20 Best Greek Products rank. The most prestigious award for us was given at the specialised apiculture international congress, 45th APIMONDIA 2017. 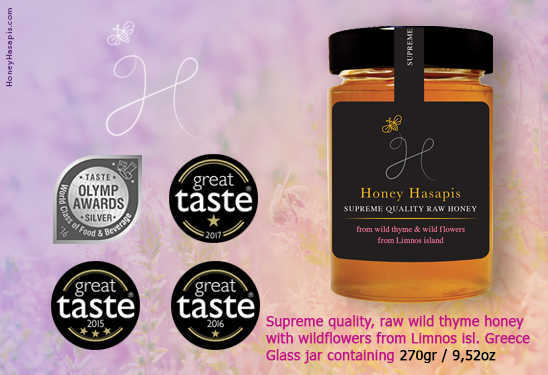 Our (monofloral) supreme quality wild thyme honey with wildflowers from Lemnos island, successfully passed all 25 strict product examination/ analysis tests, required for the product to participate in the competition. The exceptional quality, Lemnian, wild, sp. Τhymus capitatus honey, (monofloral & polyfloral) is packaged in our premisses on Lemnos island, Greece. We are certified by HACCP monitoring & control system (food safety) and we are licensed by the (MINAGRIC) Greek Ministry of Rural Development and Food. Our Lab code is 83SM04. We begin product distribution in late July, until they get sold out. All our product containers, are sealed with safety seal and are exclusively sold and distributed by us so we can guarantee the control and the quality to our customers. The glass jars are distributed in luxurious sealed packaging by HoneyHasapis and are available in 2 categories: (A) Monofloral = contains raw wild thyme honey and (B) Polyfloral (aromatic) = contains raw wild thyme with wildflowers. Each jar contains 270gr / 9,52oz. Our products are distributed internationally, capable of getting approval by each country's Food Safety standards organisation. We accept applications for international distributros interested in our supreme quality HoneyHasapis beehive products ! Additionally, Dimitris is interviewed on TV & Radio shows (see below) and he participates in the annual honey festival organized by the Cultural Activities Union of Moudros. Dimitris is inviting consumers to taste his honey product samples before they place an order in any of his local kiosks/ points of sales (enquire for kiosk locations information via our contact form). If you are a journalist, blogger, media / newspaper representative, etc. we can provide to you, a free special set of high quality images to be used in articles about us accompanied by image license terms & conditions. For students, image use is free under the term to provide a return link to our website and credit appropriate including photographer's name.